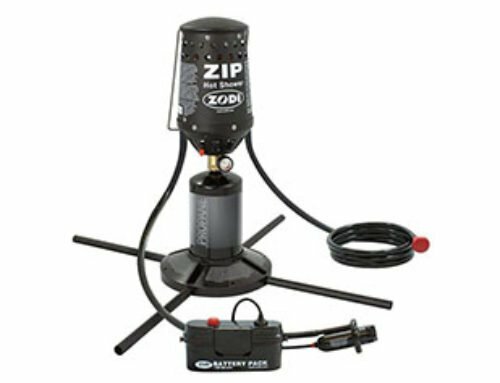 Ozark Trail’s 2-room camping shower is a great addition to any families camping setup. This shower tent offers privacy and convenience in one tent. 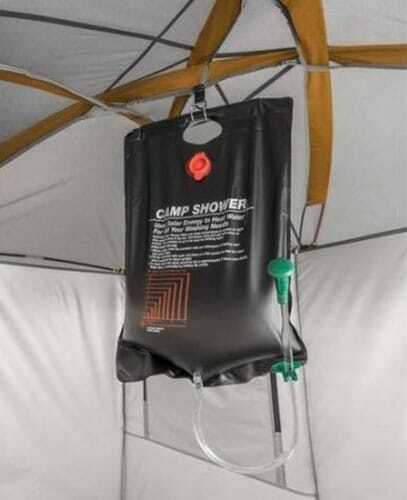 With a divided shower and changing room, this tent makes it easy to take showers no matter where you end up camping. 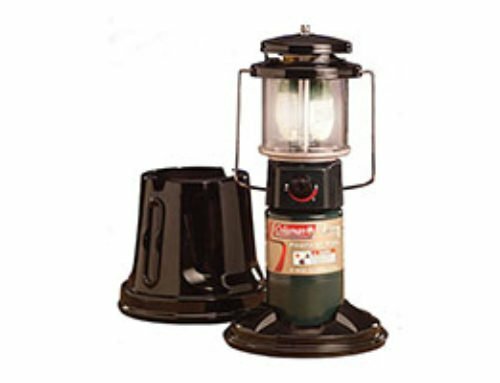 The tent is not an instant tent and set up can take a few minutes. Once the tent is up, it is solid and very sturdy. 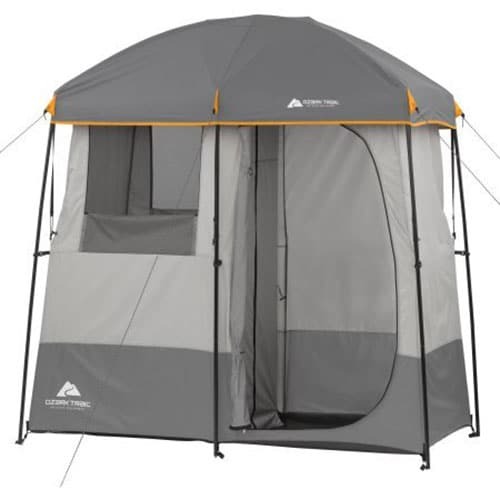 If you are considering adding a shower tent to your camping gear, the Ozark Trail 2-room shower tent is a great option. 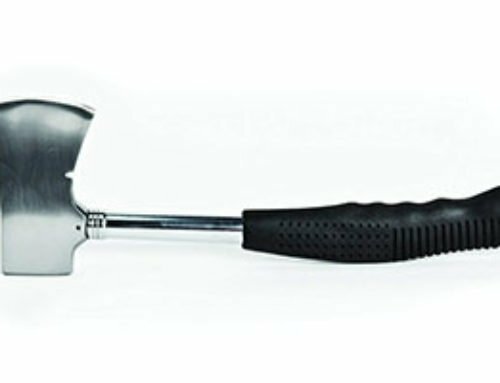 It comes with awesome features, which makes showering while camping easy and hassle-free. We really like this tent because it offers the privacy and space we wanted in a shower tent. 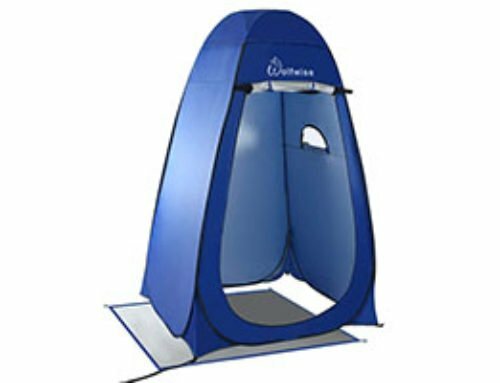 This Ozark Trail 2-room shower tent is portable but not the most portable option available. 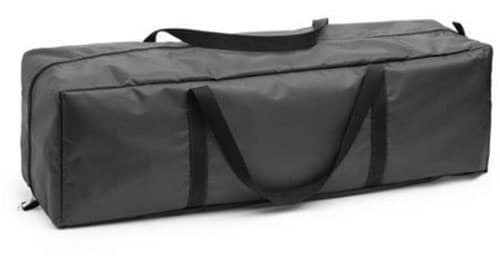 The tent does pack down into a smaller bag, about the same size as a 4-6 person tent. 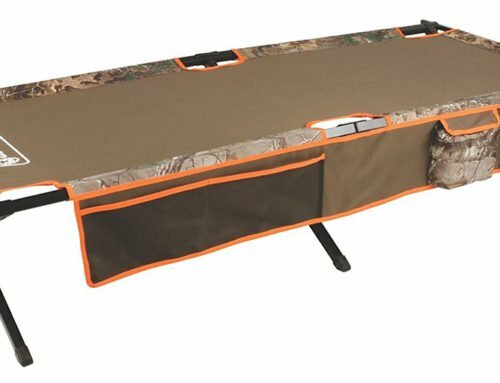 At about 20lbs, this tent is not something you want to be hiking around with but it is also not difficult to carry around if you are car camping. The size of this tent is awesome. It gives you lots of space with 2 separate rooms. One room is a changing room and the other is the shower room. While you could always use more space for changing, this tent offers lots of space for changing and showering. 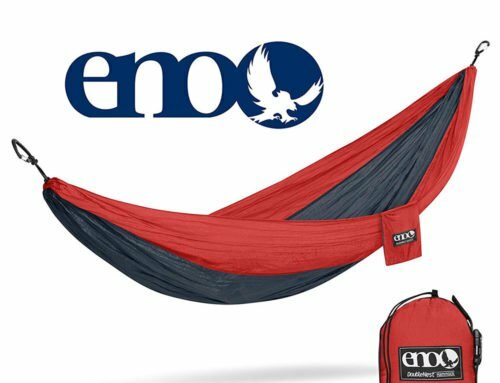 This is not an instant tent and so set up does take a few minutes. All the connector and poles are color coded, which makes the entire process easy. 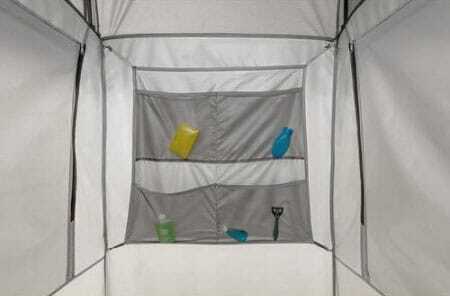 With 1 or 2 adults, set up of this shower tent typically takes 10-15 minutes. 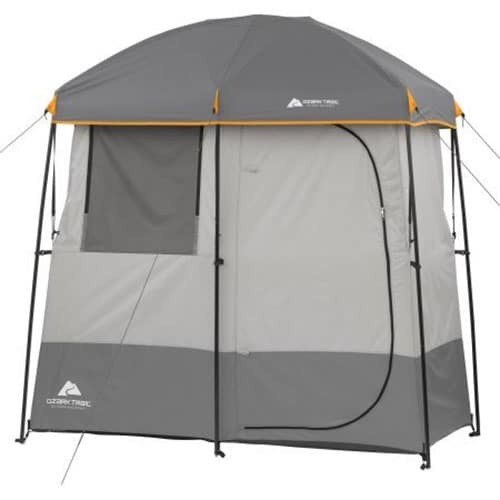 The Ozark Trail 2-room shower tent comes with some nice features and extra. There is a room divider between the changing and showering room, which prevents water from spraying into the changing room. It also comes with a pocket organizer for the shower room so you are able to organize and store all your shower products. Additionally, there is a towel rack/clothes hanging bar in the changing room, which makes it easy to keep clothes and towels off the ground. Another nice feature of this tent is that it comes with its own solar shower bag. You can fill this bag up with water, set it in the sun to warm up and then use it to take a warm shower.